No matter your experience level, it always pays to review the basics. These key principles can help you keep your workouts productive, safe and free of running injuries ! The majority of running injuries are overuse injuries. They follow the “too hard, too often, for too long” principle. Newcomers are especially vulnerable. You can’t compete if you’re injured. So choose proper footwear, train your form, and most of all don’t ignore your body. It never pays to push through an injury. Here is a non-exhaustive list of common injuries. Notice that not all of them are limited to the feet and ankles. If you’re a distance runner chances are that you’ve experienced one or more of the above. Don’t wait: get it treated as soon as possible. It’s important to deal with injuries promptly and effectively. This will get you back in action sooner and can help you avoid potentially long term injury. Most distance running injuries are lower extremity problems. They affect the feet, ankles, and lower legs. If you run, working with a podiatrist you know and trust can help greatly. Almost all elite runners (and many amateurs) have a podiatrist as part of their health care team. Even if you’re not acutely injured it’s a good idea to get a podiatrist’s assessment. 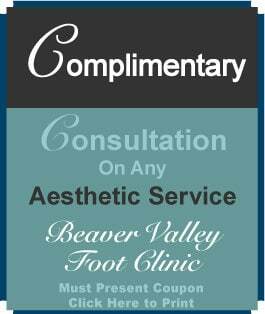 Call the Beaver Valley Foot Clinic at (878) 313-FEET (3338). 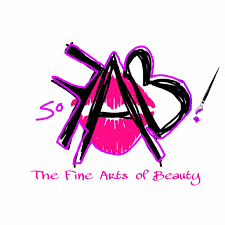 Same day and weekend appointments are available on a limited basis. Running should be challenging. If you’re pushing yourself hard enough, it will almost certainly be uncomfortable at times. Running should not hurt, however. It’s true that the more you run and the harder you train the more risk you run. Even so, there are proven methods to reduce these chances. Follow the 500-mile rule. Wear only high quality running shoes and replace them every 500 miles. Do your research—high quality doesn’t necessarily mean expensive. Get in the habit of icing down. Some inflammation is acceptable, but icing helps you avoid excessive swelling. Make sure to cross train. The pros do it and so should you. Add strength training and other cardio training such as spinning and swimming to your routine. Don’t make the rookie mistake of running “too far, too fast, too soon.” It’s no accident that the newer runners are more injury prone than more experienced ones. Improve your condition and only increase your workout distance and intensity when you’re ready. It’s OK to schedule easy days. It’s equally OK to take days off. Bear in mind that cross training is an excellent strategy to avoid overuse injuries. It can also greatly improve your overall condition. Don’t train unless your injury has healed completely. Period. Never underestimate the importance of hydration. This applies no matter what temperature you’re training in. The Achilles tendon is the largest tendon in the body. It’s also particularly vulnerable to overuse injuries, in both running and other sports. This tendon runs from the back of the leg to the top of the heel. Its main role is to connect the calf muscles to the heel, helping us to walk and run. When contracted, it presses the forefoot into the ground in a “toeing off” motion. Overuse of the Achilles tendon can result in swelling, achiness, and a pain right where the tendon joins the heel. Almost any active person can develop this condition. Rapidly increasing the frequency and intensity of your workouts. Having flat feet, a.k.a. collapsed arches. Being a beginner. Runners who take on workouts beyond their level of conditioning often develop shin splints (and many other injuries). Low quality or ill-fitting footwear. Wearing shoes which aren’t sports specific. An example is wearing tennis shoes while distance running. The tendon may tear in very severe cases. This requires surgery, but fortunately isn’t common. The development of painful bone spurs is much more common. This usually responds to more conservative measures but surgery is sometimes still required. Fortunately, this tends occur only in the most severe, longest standing cases. Any time your ankle is moved forcibly there’s a chance for a sprain. This often happens in sports and walking or running on uneven surfaces. When the ankle rolls, twists or turns it can stretch or tear the ligaments of the ankle which hole the joint together. Ligaments provide the ankle with most of its stability. When these are damaged this can result in excessive movement and a loose, wobbly joint. In most cases the ligaments on the outside of the ankle are sprained in the classis “roll” injury. The treatment you’ll need will always depend on how severe the sprain is. You may be able to manage a minor sprain yourself with Rest, Ice, Compression, and Elevation. This is the classic RICE method. Over the counter meds such as ibuprofen and naproxen sodium are also useful. If the sprain is severe and the ligaments have been torn you’ll need professional help. You may also have a broken bone, which isn’t always obvious. Many podiatrists offer X-rays on-site and can offer you treatments designed to get you better as fast as possible. · Pain when moving the ankle. · Pain when bearing weight on the injured ankle. · The ankle will be tender to the touch. · Swelling of the ankle joint. This can be severe. · Reduced range of motion. This is usually due to swelling and pain. · If the ligaments are torn completely you may feel a popping or tearing sensation. Unless the injury is very minor, it’s best to let a professional handle it. An evaluation done by a podiatrist, medical doctor, or osteopath can reveal whether you’ve stretched or torn ligaments. Most will also take digital X-ray images on site to rule out a broken bone. Seeking care is important, since left untreated moderate to severe sprains increase the chance for more sprains in the future. Should I see a podiatrist or an orthopod? Podiatrists are generally recognized as the experts when it comes to treating the foot and ankle. These specialists spend their whole surgical residency learning to operate on the foot and ankle, and thus have more experience coming into the profession than orthopedists. Some orthopedic surgeons choose to specialize in surgery of the foot and ankle, but this is the sole focus of podiatric surgeons. In most cases, it’s best to have a podiatric surgeon perform you operation. How can you tell if my ankle is sprained or broken? Ankle break symptoms: The pain is immediate and intense, often so bad that walking is impossible. However, Grade III sprains can also present like this. The only reliable way to rule out a break is with X-ray images. At well-equipped podiatry offices the doctor can perform these on site. Can I walk on a broken ankle? Should I? It may seem obvious, but it’s not a good idea to walk on a broken ankle. Or any severe ankle injury, for that matter. It’s hard to tell breaks and sprains apart, and they often occur together. A simple, clean fracture of an ankle bone or a hairline fracture may not prevent you from walking, but it still isn’t a good idea. 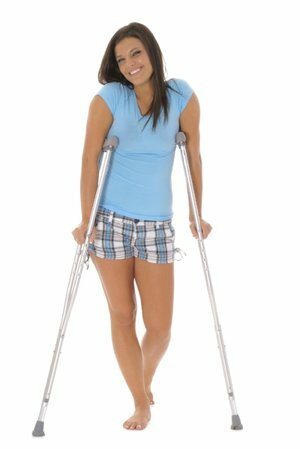 For breaks and severe ankle sprains, it may not be advisable to bear weight for up to several months. During this time you should still be doing physical therapy, however. Can I bear weight / walk on a sprained ankle? If you’re able to walk immediately after you’ve sprained your ankle you likely have a very minor injury. It’s especially likely that you haven’t fractured any of the bones in the ankle. The ligaments have been overstretched and there will be swelling and possible pain, but the actual damage is minimal. How will I know if I also have an ankle fracture? · Intense, immediate throbbing pain. · Pain which will decrease with rest, yet increase with activity. · The area will be tender to the touch. · Any sort of visible deformity. · An inability to walk or even bear weight on the effected ankle. How long do sprained ankles take to heal? A Grade I ankle sprain will heal in about 1-2 weeks. Only minor over-stretching has taken place and minimal damage has occurred. Grade II sprains involve more severe stretching an partial tears, and can take up to 6 weeks to recover. These figures are approximate, and any Grade II or Grade III sprain should receive physical therapy to prevent further sprain injuries. Can podiatrists perform ankle surgery? Podiatrists routinely perform all manner of surgeries on the foot, ankle, and lower leg. These podiatric surgeons often undertake advanced residency programs in order to perform highly complex procedures which cover the full spectrum of possible ankle conditions. Both podiatric and orthopedic surgeons are both good choices for patients who require ankle surgery. What matters is experience, and in general podiatric surgeons have more experience than other specialists since their sole focus is on surgery of the foot and ankle. This extremely common running injury is technically known as “medial tibial stress syndrome.” Regardless of what it’s called, it affects millions of runners and other athletes across the globe. Shin splints are an overuse injury caused by repetitive stress to the lower legs over long periods of time. In cases of shin splints, the muscle and soft tissue surrounding the long bone of the leg (tibia) becomes inflamed. This condition is capable of causing a surprising amount of pain. Not surprisingly, distance running is the leading cause of shin splints. This condition can and does happen to other weight bearing athletes, however. Shin splints are quite common among football players, basketball players, and many other types of athletes. It’s also important to realize that newer athletes are especially prone to shin splints. Beginners should gradually increase they’re fitness levels. Exercising beyond the level of your condition is a common cause for all types of injuries, including shin splints. Athletes with either high arches or collapsed arches (flat feet). Those with lower leg muscle imbalances. People who train on hard surfaces such as asphalt or concrete. Those who don’t have high quality, sport-specific footwear that fits properly. 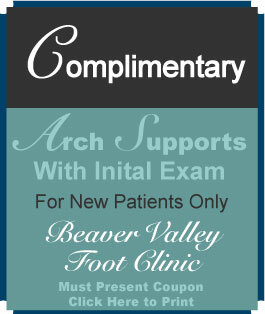 At the Beaver Valley Foot Clinic we help patients with shin splints every day. Running doesn’t have to hurt. Call us at (878) 313-FEET (3338) to schedule your appointment today.